March 8th marks International Women's Day, a day to recognize the achievements and progress women have made and, at least for me, how much further women have to go. 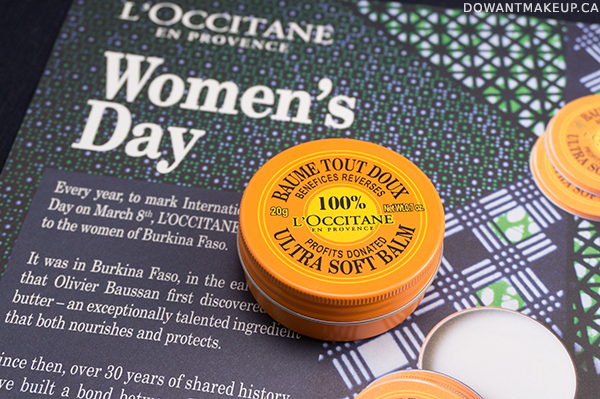 In recognition of this day and the Burkinabé women L'Occitane has been working with for over 30 years, L'Occitane is offering the limited edition Ultra Soft Balm. What makes this balm special is that 100% of the profits (that's retail price less taxes and transport and production costs) from Ultra Soft Balm sales will go directly to organizations that promote women's entrepreneurship in Burkina Faso. L'Occitane's projects include literacy programs, as well as providing financing through microcredit programs to enable women to start their own businesses and become financially independent. Production of shea butter is generally women's work in Burkina Faso, and due to international demand, shea butter has become a major export for Burkina Faso's economy. A little Googling revealed that men take a significant cut of profits from acting as middlemen in the export market (source). I was genuinely impressed to learn that with help from UNIFEM, L'Occitane chose to cut out the middlemen to buy directly from shea group networks at fair trade prices, thus putting a greater share of profits back in the women's pockets (source; source). Okay, on to the actual review. 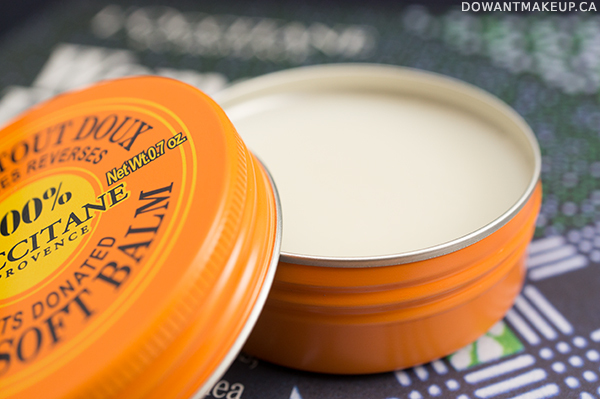 I love Ultra Soft Balm's delicate, apricot scent; I seriously could not stop sticking my nose in it. I couldn't pin it down as apricot without help from press materials though, I just knew it smelled gooood. It's a floral, fruity, and a little sweet, but not so heavily scented that people who don't like fragranced products would definitely avoid it. 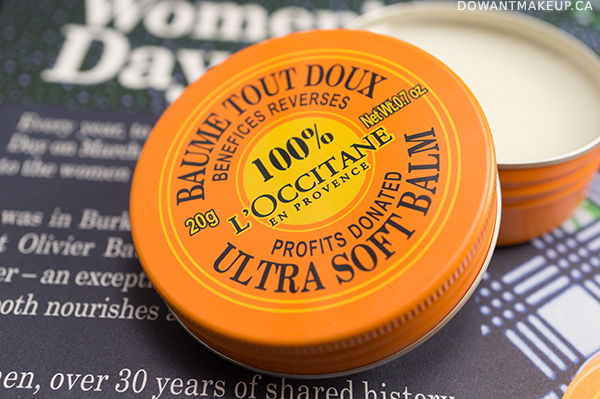 Ultra Soft Balm (also called Shea Apricot Solidarity Balm) is limited edition and the particular formulation is unique in L'Occitane's current lineup. Although the Ultra Soft Creams are packaged in similar tins, they are totally different products: the creams come in much larger 100 ml format, and have the creamy, whipped texture of a traditional body moisturizer or butter with 10% shea butter content. Overall, I absolutely recommend checking this out before it's sold out. Portable, super moisturizing, multi-purpose, lovely scent, costs less than 2 coffees, and profits support a good cause? I'm going out today to buy another one or two of them.